As many market participants are aware, the methods in which effective investor relations campaigns are conducted are constantly changing. For years, the assumption was that all a company needed was a phone bank with a lead list of investor phone numbers and a recent press release or corporate update to catch the attention of potential investors and pique their interest. In today’s digital world, the smile-and-dial approach of yesteryear is antiquated and is now regarded as ineffective and inefficient. In the current investment landscape, retail investors and institutional investors alike spend a sizeable portion of their day online, just like anyone else. They may open their Facebook page first thing in the morning for news, or check their Twitter feed at lunch for updates. With our smartphones and connected devices within arm’s’ reach at all times, these technologies have gone further than changing social interactions, and have even begun to influence the way investors uncover investment opportunities. 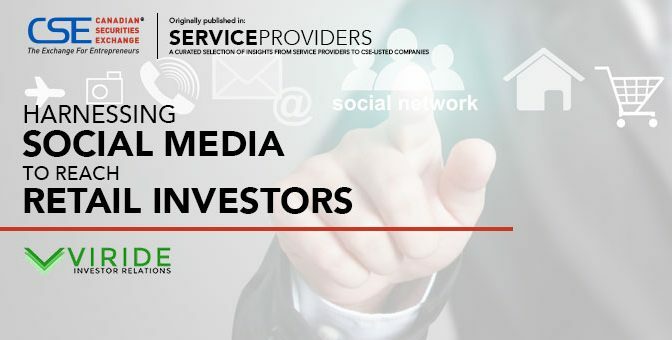 So, if a large portion of potential investors are using social media platforms to find news and connect with people, why not harness the power of social media to connect with potential investors and provide company news or updates? It may not surprise you that retail investors’ trading decisions are influenced by social media. What is surprising however, is that “80% of institutional investors use social media as part of their regular work flow, and approximately 30% of these investors say information obtained through social media has directly influenced an investment recommendation or decision,” according to a recent study from Greenwich Associates. Today, investment decisions are made because an investor has received multiple pieces of information from a variety of sources that they know and trust. As retail investors make more and more investment decisions on their own, without the assistance of an advisor, there has been a growing demand for online communities and crowdsourced investment insights where they can have open discussions about various investments with fellow traders. While there are handfuls of investor forums out there, social media channels like Facebook, Twitter, and LinkedIn still reign supreme when it comes to targeting and reach. The ability to target followers of similar/competing companies coupled with the unrivalled user bases that these platforms possess make them ideal weapons for any investor relations warchest. Modern investor relations campaigns require bidirectional communication, and that’s what makes these social media platforms even more useful. Not only can you share information to existing and potential investors, but you can also glean information from the very same people with polls and more. Your IR efforts should constantly be adapting to the ways that investors are gathering their information, and social media is no exception. Be sure to consult an expert though, as both IIROC and the SEC have complex rules governing such communications. This story was written by Viride Investor Relations and featured in Service Providers magazine.